To insure that your pet has a safe and comfortable air trip, the ASPCA offers these tips. Make an appointment at your pet’s veterinarian for a check-up, and discuss your plans to take your pet on a trip. Obtain a health certificate from your veterinarian dated no earlier than IO days before departure. You must feed and offer water to your pet four hours before delivery to the airline. Exercise him/her before putting the animal in the carrier. Make A reservation for you pet. Book a direct flight it at all possible. If you’re traveling in hot weather or to a wann climate, book a night flight. Purchase a USDA-approved shipping crate. It should be large enough for your pet to stand, sit and change position in comfortably. 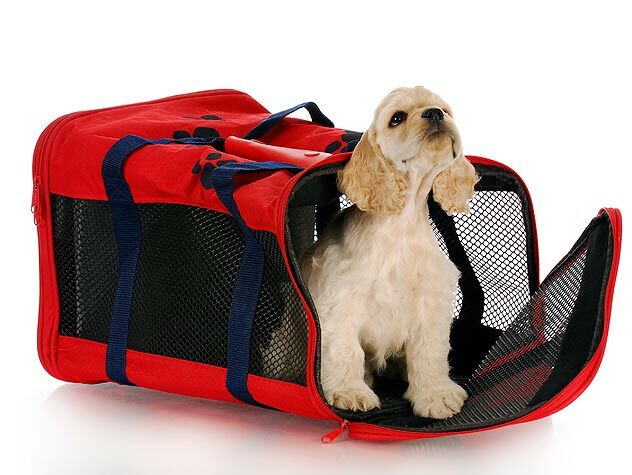 You can purchase such carriers from many pet supply stores and from airlines. Write the words “LIVE ANIMAL” in letters no smaller than I ” high on the top of the crate and on at least one additional side. Use arrow indicators to prominently and boldly show the upright position of the carrier. Write the name, address and telephone number of the destination point of your pet, whether you are traveling with him or someone else is picking him up. Secure this information to the TOP of the carrier. Your pets should also be wearing identification tags on a collar (elastic for cats). Line the crate bottom with some type of bedding – shredded paper or towels – to absorb accidents. Crate must have two dishes, one for food and one for water, attached to the inside of the crate and easily accessible to airline personnel. Freeze the water so that it will not splash out during loading but will melt by the time the pet is thirsty. 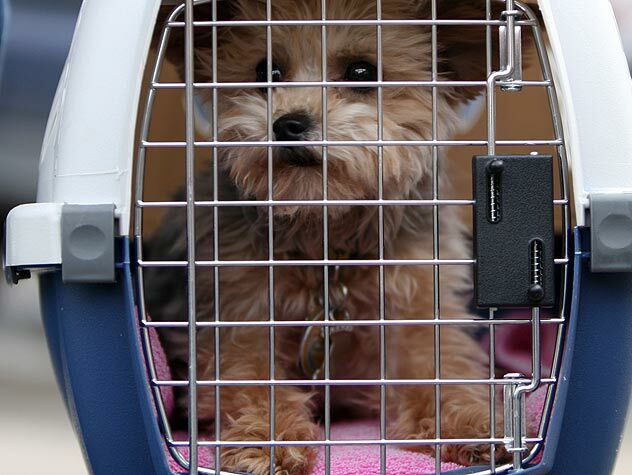 Get your pet accustomed to the crate prior to the day of departure. Do NOT lock the door on the crate. Make sure it is securely closed, but not locked, so that airline personnel can open the crate in case of emergency. For trips longer than 12 hours, attach a plastic bag containing dry food on top of the carrier with feeding instructions for airline personnel.